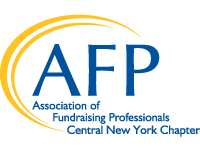 Central New York contributions to the Be the Cause campaign promote diversity and inclusion and provide educational scholarships for educational luncheons and local conferences for AFP Members and NonMembers. Please considering a donation today. Click on the logo above to learn more.